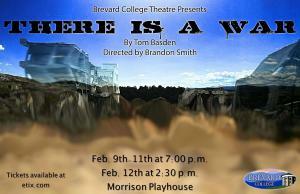 Brevard College Theatre presents the United States premiere of “There Is A War” by Tom Basden. The show will run in The Porter Center for Performing Arts’ black box theatre, the Morrison Playhouse, Feb. 9-11 at 7:00 p.m. and Feb. 12 at 2:30 p.m. Tickets are just $10 and are available online at etix.com, at Southern Comfort Records on Main Street Brevard, and at the box office thirty minutes before each show. “There Is a War” is directed by Brandon Smith and features a diverse cast of over 20 BC students. It is a poignant work that blends tragedy and comedy in an eye-opening way. All opinions and views are exposed, and the characters attempt to find what it means to be human in a society of perpetual warfare. The play follows a doctor, Anne, beginning on her first day at war. In two powerful, fast-moving acts, Anne challenges her own beliefs about right and wrong as she attempts to fulfill her role as a doctor, despite adversity. The production is the result of the collaborative senior capstone project. The collaborative senior capstone is a concept that is a part of the new theatre degree plan that began in the 2014-2015 academic year, and the project serves as a demonstration of knowledge and skills that students have acquired during their time studying theatre. Within the collaborative capstone project, students can focus on different disciplines of theatre, including design, performance, and management opportunities. Each senior designs or oversees a different aspect of the production. The collaborative senior capstone course is the result of four years of training and experience in the department, and is the complement to the first-year theatre course, “Collaboration in Theatre.” There are discussions about teamwork in different departments of theatre and the importance of collaboration in design. The courses offer a more in-depth look at professional development. Each course requires demonstration of knowledge and skill with direct feedback to imitate real-world experience. To prepare for summer work in theatre, or for graduate school and jobs following graduation, emphasis is placed on mindful goal setting and communication with professors and other theatre professionals. Josh Goldstein is the sound designer for “There Is a War,” Karen Mackillop is the costume shop manager, and Logan Taylor is the lighting designer. Ian Hueston is the makeup designer and properties co-designer, and is playing the role of Dr. Moore. Garrett Rhodes is the technical director, and is playing the role of Dr. Holmes. Alex Webster is the assistant director, head of publicity, and is playing the role of Gordon. Integrated studies major Kaylee Smith is the scenic designer. Other members of the production team include Courtney Sharp as the stage manager, Malynne Petoia as the assistant stage manager, Thomas Cox as the master carpenter, and Teila Vochatzer as the properties co-designer.